1. In a mixing bowl, cream the butter and shortening; gradually add sugar. Add egg, milk and vanilla extract. Combine dry ingredients; gradually add to creamed mixture. Mix well. Cover and refrigerate for at least 2 hours. 2. Roll out dough on a lightly floured surface to 1/8-inch thickness; cut with a 2 1/2-inch heart-shaped cookie cutter dipped in flour. 3. Place half of the cookies on greased baking sheets; spoon 1/2 teaspoon filling in the center of each. 4. 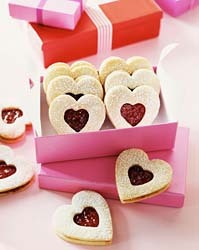 Use a 1 1/2-inch heart-shaped cutter to cut small hearts out of the other half of the cookies. (Bake small heart cutouts separately.) Place the remaining hearts over filled cookies; press edges together gently. Fill centers with additional filling if needed. Sprinkle with sugar. Bake at 375 degrees F for 8 to 10 minutes or until lightly browned. Cool on wire racks. Yields about 4 1/2 dozen filled cookies. If you wish to join our baking class, please contact us at 66 86 3059825 or realfruit@realberri.com for schedule. >>If you have any questions or queries about our product applications or need more recipes, please feel free to contact us anytime.